Enjoy a different kind of rafting experience with this three-in-one adventure from Alanya, which includes a full day of rafting, canyoning, and ziplining. 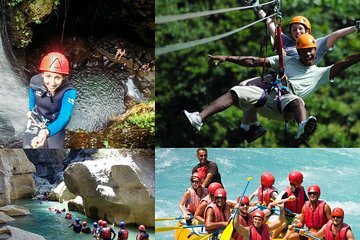 Ziplining across the canyon for splendid aerial views sets this tour apart from other similar packages. Enjoy time at Koprulu Canyon, with two contrasting formations: a narrow warm-water canyon and a wide cold-water canyon. Plus, whitewater rafting spans two courses at Koprulu and Koprucay River.